The English name of Antelope Canyon was inspired by the herds of pronghorn antelope that once roamed freely in the canyon. Antelope Canyon is the most visited canyon in the American Southwest. It is also the most photographed. Both of the Antelope Canyon sections are found in the LeChee Chapter of the Navajo Nation. This region gets around three million visitors a year, due largely to Lake Powell and the Antelope Canyons. Antelope Canyon can only be visited on guided tours. Part of the reason for this is flash flood danger. Regional rains can quickly flood the canyon, even if they don't fall on the canyon sections themselves. 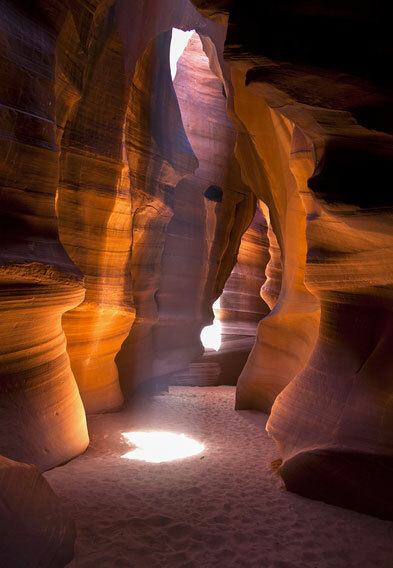 Found near the city of Page, Antelope Canyon ranks high among the best natural attractions in Arizona. Tours of the canyon are extremely popular. So much so, that visitors are limited to two hours when visiting each of the canyon's two main sections. These sections are known as Upper Antelope Canyon and Lower Antelope Canyon. 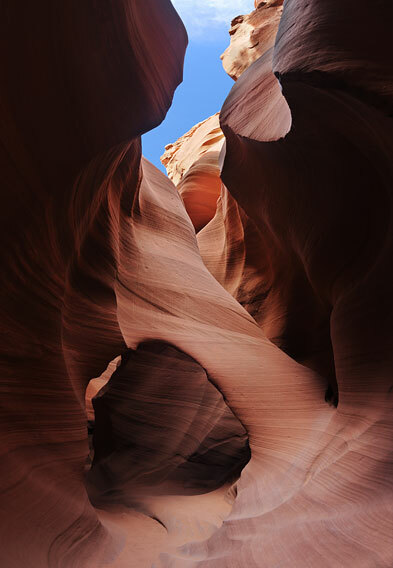 Both of the Antelope Canyon sections are truly awe-inspiring, and therein lies the allure for visitors. Worthy of note is how the swirling sandstone colors change with the alteration of the sun's position in the sky. Drop by for a look around, and you are sure to be amazed. Also, before or after your Antelope Canyon visit, you can visit some of the general area's other natural wonders, such as Horseshoe Bend and the Grand Canyon. Visits to Antelope Canyon are also easy to pair with visits to Lake Powell, which is one of the country's most famous manmade reservoirs. The best time to visit Antelope Canyon is arguably mid-March to early October. During this period, it is more common for beams of sunlight to flood in the crevices, allowing for optimal viewing conditions. The summer season in particular is when such lighting conditions are most common. The most visited of the two canyon sections that make up Antelope Canyon is Upper Antelope Canyon. Known to the native Navajo people as Tse'bighanilini, this portion of the canyon is situated at an elevation of approximately 4,000 feet above sea level and was largely carved out by a stream. This explains the Navajo name of Tse'bighanilini, which translates to "the place where water runs through rocks." The walls of Upper Antelope Canyon rise as high as 120 feet above the streambed. This is the most visited of the two Antelope Canyon sections, and there are two main reasons for this. First off, its entrance and entire length are at ground level, so no climbing is required to get in and out. Secondly, beams of sunlight enter Upper Antelope Canyon with more frequency than they do at Lower Antelope Canyon. The Navajo name for Lower Antelope Canyon is Hasdestwazi. This translates to "spiral rock arches." Lower Antelope Canyon is every bit as amazing as Upper Antelope Canyon. Casual sightseers don't frequent this part of Antelope Canyon as much, however, as a certain amount of climbing is required to get in and out. 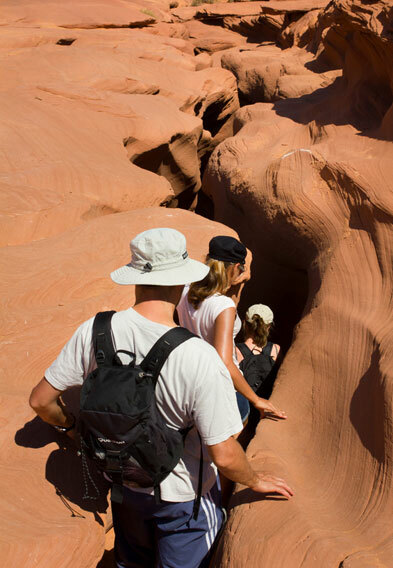 Metal stairways have been installed in the more technical climbing areas, and while the hiking is more difficult than in Upper Antelope Canyon, you don't have to be an expert trekker to enjoy this section. The lighting at Lower Antelope Canyon is best in early morning hours and late afternoon. Antelope Canyon tours are well worth adding to the agenda when traveling around Northern Arizona. Anyone who is interested in enjoying such tours should know that it is necessary to book an authorized guide. Included in the tour prices is a Navajo Park Permit, which is required for any non-Navajo member who wishes to enter the region in general. Tour info for Antelope Canyon is available at the Lake Powell Navajo Tribal Park Office, which is found just three miles south of Page along Coppermine Road. This road is also known as Navajo Route 20. Travel tip: Another interesting tour to consider while in the area is a tour of the Rainbow Bridge Trail. 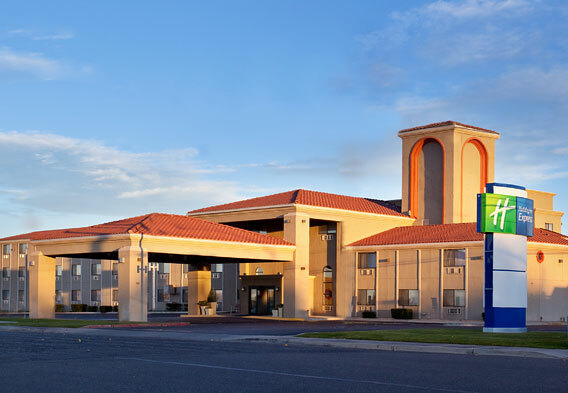 Due to Antelope Canyon's proximity to the city of Page, many visitors choose to book a stay at one of the Page hotels. There aren't any overly luxurious hotels in Page, though there are some area accommodations that offer a good amount of amenities. If you can't find a Page hotel that ultimately suits your wants, you might entertain the option of renting a houseboat at one of the Lake Powell marina resorts. Some of the houseboats are quite luxurious. Camping in the Page area is also a consideration. Among the best campgrounds in the area is the Wahweap Campground. It offers both RV and tent sites near the water. Due to Antelope Canyon's location near the Utah border, area visitors can also consider staying at one of the hotels on the Utah side. The Utah city of Kanab offers some good accommodations, for example. The Utah town of Big Water is even closer to Page and Antelope Canyon and is also worth keeping in mind.